The popularity of creatine as a supplement has been rising exponentially. Creatine supplementation first gained popular attention in the early 1990s, after high profile Olympic athletes competing in events at the Barcelona Olympic Games believed their performance had benefited from creatine supplementation. There are different varieties of creatine available in the market. Most widely used and effective one is creatine monohydrate. But creatine monohydrate won’t dissolve properly. To overcome this problem we can use micronized form. Micronized creatine monohydrate dissolves in water more quickly. Creatine is a nitrogenous organic acid produced in the body. In human body most of the creatine is found in skeletal muscle. It is normally produced at a rate of about 1 gm per day. It can also be obtained from the diet through meat products. Its main function is to facilitate recycling of ATP. Adenosine Triphosphate (ATP) is a small molecule found in cells. ATP is used to transport chemical energy required for metabolism. ATP carries chemical energy to the place where it is needed. When the covalent link in the ATP breaks we obtain two components, adenosine diphosphate (ADP) and phosphate. The breakdown of the covalent link of phosphate liberates energy required for the action. Muscle stores phosphocreatine for rapid resynthesis of ATP from ADP. Generation of peak anaerobic power and anaerobic capacity in short-term, high intensity exercise may be dependent upon endogenous levels of ATP and phosphocreatine. Particularly phosphocreatine is used to rapidly regenerate the limited intramuscular supply of ATP. Supplementation of creatine increase muscle stores of phosphocreatine. That is creatine enhance the resynthesis of ATP from ADP during intermittent, high intensity, short-duration exercise. Most of the studies carried out to find the effect of creatine on performance concluded that daily supplementation of creatine improved ATP synthesis through phosphocreatine hydrolysis and mean power output during short term, maximal exercise. 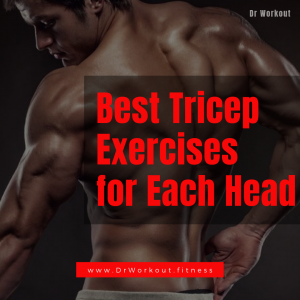 Moreover, studies strongly indicated that the improvement in performance is associated with the increased phosphocreatine availability for the synthesis of ATP. Creatine supplementation can boost the power output of resistance training because of the increased amount of available phosphocreatine in muscle. In a study conducted to find out the effect of creatine supplementation for 28 days along with resistance training, 30 male subjects are participated in the research. The findings from the study suggest the addition of creatine supplementation to resistance training not only increased the power output. 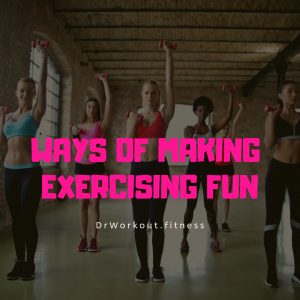 It also increased the fat free body mass, blood flow, muscular strength and resting energy expenditure. 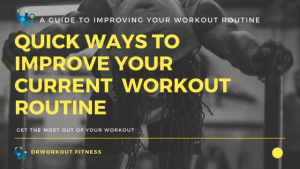 Several studies found out that creatine supplementation with resistance training can increase a 12% improvement in strength to 20% and 12% improvement in power to 26%. 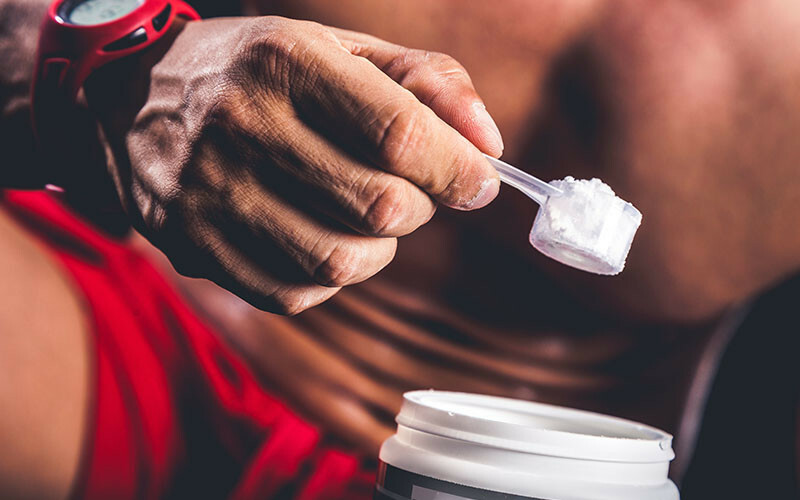 A meta analysis was conducted to determine the effect of creatine supplementation on body composition and performance. The study compared the effect of creatine supplementation on effect size and body composition. The study noted that effect size was greater for loading phase compared to maintenance phase. The meta analysis concluded that creatine have inherent lean mass building property. Creatine supplementation can also affect blood glucose. A study conducted to examine the effects of creatine supplementation, on glucose tolerance in 22 healthy males. For healthy sedentary males because of the creatine supplementation blood glucose reduced following an oral glucose tolerance test 11-22%. The study concluded that creatine supplementation, combined with resistance training, can improve glucose tolerance but does not affect insulin sensitivity of the body. In a study 4 g of creatine was given to adolescent females suffering from depression problems. The creatine supplementation was able to significantly reduce depression (56%) over a period of 8 weeks. In another study aimed to find the effect of creatine on depression, in the study 8 human subjects suffering from depression are participated. They were treated with 4-5 grams of creatine for 4 weeks. The study found out that 1 month supplementation of creatine improved depression in all human subjects. A study was conducted to determine the effect of short term supplementation of creatine in hormone response, 20 male swimmers are participated in the study. The results of study shows that participants improved their performance by 4.6% and testosterone had increased at least by 15%. But growth hormone and cortisol were not affected by the short term supplementation. It is found that for average healthy males DHT can be increased by 56% during creatine loading phase and it can be set 40% above the baseline by maintenance phase. The ratio of DHT to Testosterone can remain 36% higher during loading phase and during maintenance phase it will remain 22% higher. Myostatin act as a negative growth factor to muscle. Creatine supplementation in along with resistance training can leads to greater reduction in serum levels of myostatin. 8 week creatine supplementation can reduce myostatin up to 17%. Creatine supplementation along with resistance training can improve calf, legs, forearm blood flow by 30%. 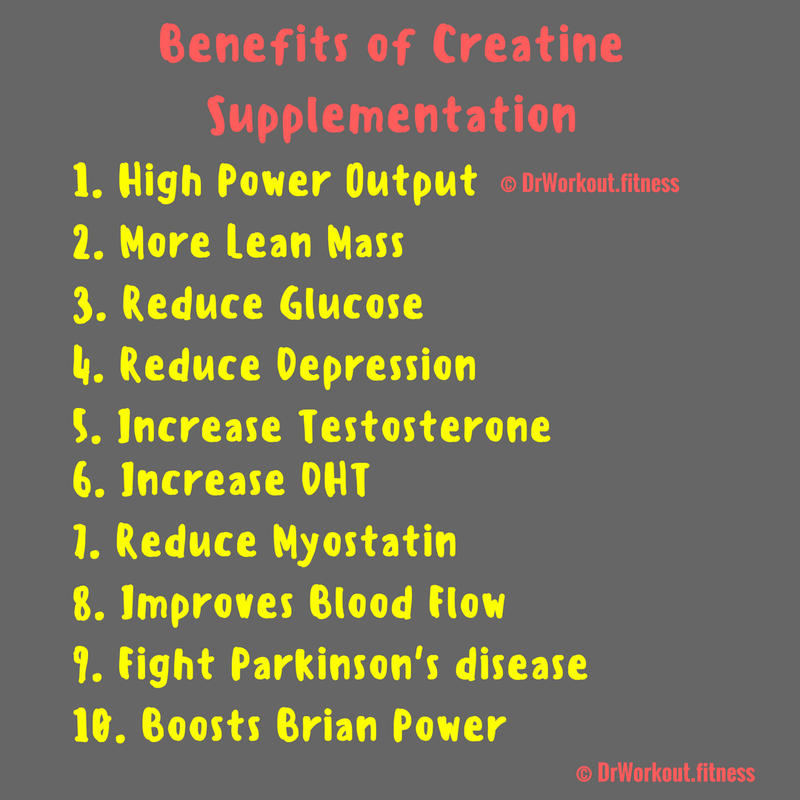 Creatine supplementation can improve blood flow and hemo-dynamics during exercises. Large reduction in Dopamine level causes the death of brain cells. Creatine can improve mitochondrial function and cellular bioenergetics. Creatine is a promising neuro protection agent in neuro degenerative diseases. In a study aimed to find the effect of combination therapy with coenzyme Q10 and creatine in Parkinson’s and Huntington’s diseases found that the combination of CoQ(10) and creatine produced additive neuroprotective effects on improving the motor performance and extending survival ability of test subjects. That is creatine supplementation is very useful in the treatment of neurodegenerative diseases such as Parkinson’s disease and Huntington’s diseases. It is scientifically proven that creatine can boost brain power. 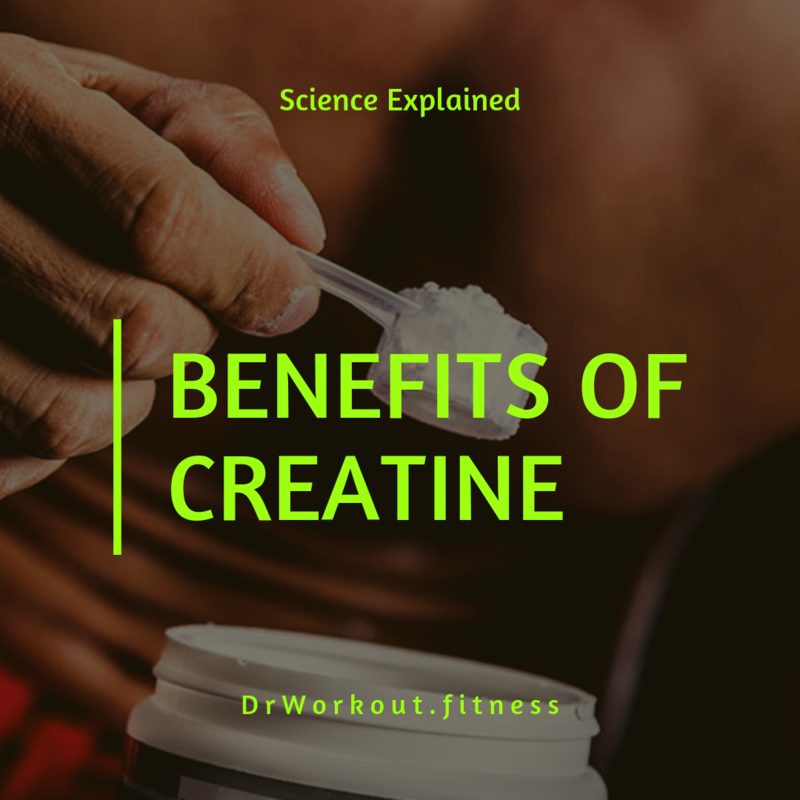 Researchers from the University of Sydney and Macquarie University, tested the effect of creatine supplementation on brain power by giving creatine monohydrate to 45 healthy test subjects. General IQ tests followed by their ability to remember long number sequences also tested. The researchers found that the ability of adult volunteers to remember long number sequences improved from 7 digits to an average 8.5. 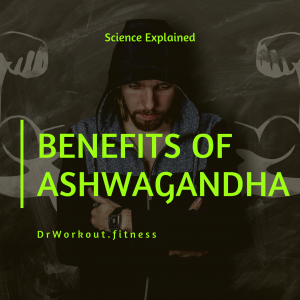 It is because the creatine boosts the energy available for computational tasks. 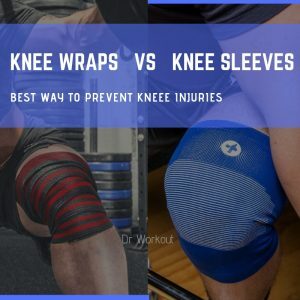 Comparison of creatine ingestion and resistance training on energy expenditure and limb blood flow. If you have any doubt about this article feel free to ask below. We are here to help you. Stay Tuned!